Casa Vinicola Zonin is the biggest family wine company in Italy, indeed one of the largest family wine concerns in all of Europe. From their Veneto roots, the Zonins have expanded to own estates not only in local appellations including Friuli and Prosecco, but on to Piedmont, Tuscany, Puglia, Sicily and indeed, the length and breadth of the country. They have also expanded their vision across the Atlantic, to Virginia where their highly-regarded Barboursville Vineyards estate is planted with both French and Italian varieties, including Nebbiolo and Barbera. Zonin is undoubtedly a significant producer, with 20 full-time agronomists and 15 winemakers on its staff. The quality of wines across their portfolio of estates has always been good, but perhaps has never reached the highest levels: Zonin’s reputation has been for solidly good, and very good value wines, but not for exciting wines that pushed the boundaries of their appellations. My visit was to Zonin’s Castello d’Albola estate in Tuscany, producer of Chianti Classico and ‘super-Tuscan’ wines. There I would meet technical director of the wine operations, Domenico Zonin, and the winemakers for Castello d’Albola, Alessandro Gallo, and for Zonin’s Rocca di Montemassi estate in the Maremma region of Tuscany, Federico Giovannetti. 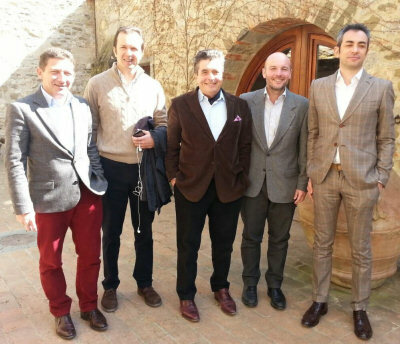 But also present was Professor Denis Dubourdieu of Bordeaux, along with his right hand man, Christophe Olivier (the photo shows, from left to right, Christophe, Domenico, Denis, Alessandro and Stefano Ferrante, the Chief winemaker for the whole Zonin group). 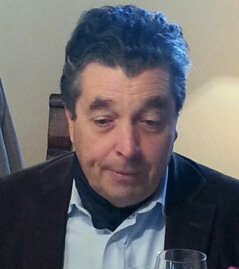 Denis Dubourdieu is one of the world’s most respected authorities on vine growing and wine making. As well as his Professorship at Bordeaux University, he is owner of several estates in Bordeaux including Châteaux Clos Floridène, Doisy-Daëne and Reynon, and consults at other Bordeaux estates including Cheval Blanc. But Dubourdieu has also become one of the world’s most respected consultants working in a global arena. One of his long term associations has been with Casa Vinocole Zonin, where he has worked since 1999, first in their vineyards in the Maremma and Veneto, and then across several of the estates in the portfolio. Here at Castello d’Albola, the work of the Professor and his team has concentrated on the vineyards. But they have recently taken on a more integrated role that includes winemaking, all aimed at elevating the wines of Castello d’Albola into the top ranks of the region. Castello d’Albola is situated amongst the high hills and pine forests of Radda in Chianti, one of the coolest sub-regions of the Classico zone. Its vineyards rise from 250 metres elevation to those surrounding the Castello at 600 metres. Group agronomist Carlo de Biasi (left) took me on a comprehensive tour to see the before, after and yet to be of the Castello d’Albola estate. The sizeable estate of 1000 hectares (with 150 under vine) is in the midst of a massive replanting programme being overseen by Carlo and Denis Dubourdieu. Five hectares per year are being completely transformed (or “renovated,” as Carlo puts it). At 50,000 Euros per hectare that’s a cool quarter of a million for this estate alone, but similar work is going on across the Zonin portfolio of companies. Why the wholesale change to rootstocks, clones, planting densities and training systems? Denis Dubourdieu explains: “There are many pests and diseases that can afflict a vineyard, from Phyloxerra to Odium. But the biggest pest of all is the Professor of Viticulture.” Denis Dubourdieu, Professor of Viticulture at the University of Bordeaux, is joking of course, but he points out that the old vineyards of Castello d’Albola were planted 30 or 40 years ago when thinking on wine production was very different. The old system saw very widely spaced rows of vines, and very widely spaced plants within those rows – every vine two metres or more from its nearest neighbour. The vineyards were also planted with rootstocks and vine clones maximised for vigour and yield. The whole vineyard was planned around mechanisation, to minimise labour: machines could harvest easily, and there was little need to plough, prune or tend the vines. The high yielding vines produced copious large bunches and were easy to manage. The return on investment may have been good, but purely in terms of cash, not necessarily in terms of wine quality. I toured both the old vineyards (pictured right) and the renovated vineyards where planting density has been more than doubled (now each vine in a row is only 80cm from its neighbour), the late-ripening, small-berried and low-yielding Sangioveto clone has been planted on selected rootstock and new training systems have been introduced. Together with sustainable, low chemical use practices and a little green harvesting on these young vines, the quality of juice being produced has dramatically improved. Soils are typical of the region, either Alberese (a fine-grained, compact limestone) or Galestro (clay-based shale). 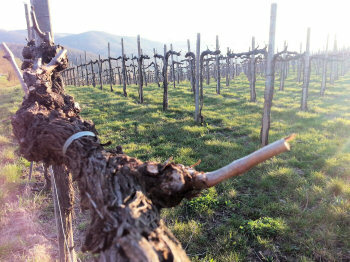 That work to replace the old vineyards – along with brand new plantings following the template on virgin ground – is ongoing, but although the home team at Castello d’Albola was already seeing year-on-year improvements, from the 2013 vintage onward Denis Dubourdieu and his team are consulting not only in the vineyards, but in the winery too. Amongst many refinements, out went 100% use of small 225-litre barriques in favour of a major proportion of large 2,500-litre ‘botti’, and the regime of remontage (pumping over) has been drastically scaled back to make extraction softer and less aggressive. The tasting compared several vintages of the wines of Castello d’Albola and other Zonin estates, to see what difference could be discerned following the changes to viticulture and winemaking that the teams in France and Italy have made. The result witnessed by my tasting of five vintages of the Castello d’Albola Chianti Classico Riserva are impressive: though there is a definite improvement in quality year on year, the tasting of an early sample of the 2013 vintage shows a huge transformation with a much brighter, purer fruit quality shining through under the guidance of Denis Dubourdieu and his team from Bordeaux. Acciaiolo was the first wine made at Castello d’Albola, a “super Tuscan” blend of Sangiovese and Cabernet Sauvignon. The name comes from a family that lived on the farm in the renaissance and who built the original cellars. Its first vintage was 1980, a year after Zonin bought the estate. Acciaiolo was meant to demonstrate power and elegance working together, but the Zonins decided that although a good wine, it was not representative of the area, so the Chianti Classico Riserva came later, 100% Sangiovese and meant as a ‘terroir wine’. Winemaker Alessandro Gallo says they look to the future of the estate as delivering a very pure expression of Chianti Classico. A 50/50 blend approximately of Cabernet Sauvignon and Sangiovese which spends 14 months in French oak, one third new, and one third each one and two years old. Both the 2006 and 2007 vintages tasted here were warm years, ’06 marginally warmer. This has ripe cassis, berries and blood, maybe a little cedar, with tobacco and earthiness. The palate is tannic, with a straightforward fruit at the core, earthy and spicy, but at this stage lacking a little generosity? Big tannins and good acidity, a little smoky and tight, but there is black fruit though outweighed at this stage. Denis is certain this is in a good stage of its evolution. 90/100. Creamier, mintier, and a fresher on the palate. There is a creaminess to this, with more lift and finesse, perhaps not the brooding power. The palate is much smoother and softer than the 2006, with still a tight and structured core of tannin and acidity, with a touch of greenness perhaps, but a more harmonious palate. A little sour lemon note adds a savoury element. Very different from the 2006, certainly does not have the structure and muscle, and whilst I’d prefer the softer appeal of this to drink now, it perhaps lacks a touch of mid-palate fruit weight and ripeness. 89/100. More oak present, and a much brighter fruit quality, a hint of cherry as well as spice and cedar. A hint of vanilla. The fruit is edgy and racy, with lots of élan, that cherryish edge and good weight and texture. Not a hugely complex wine, finishing on spice, but good drinking and balance. Perhaps a tiny touch of hollowness at the core. 90/100. A barrel sample of the ‘new’ wine made in consultation with Denis Dubourdieu. Now 60% goes into large ‘botti’, and of the 40% in barrel only 15% is new oak. Terrific inky purity from young vineyards that have been renovated. Obviously very youthful aromas, but has violet and kirsch lift and purity, with a gentle tobacco note, but really all about the buoyancy of the fruit. The palate too has wonderful balance and a dry, savoury freshness. It has energy and the sweetness of really ripe and naturally concentrated fruit, with a silkiness to the tannins and a x-factor of charm that is missing in both the 2010 and 2006. A clear step-change in style and I have to say, quality. 92-93/100. Find all stockists of Castello d’Albola wines on wine-searcher. This is the newest estate in Zonin’s portfolio, established in the late 1990s. It is based in the Maremma, on the Tuscan coast. 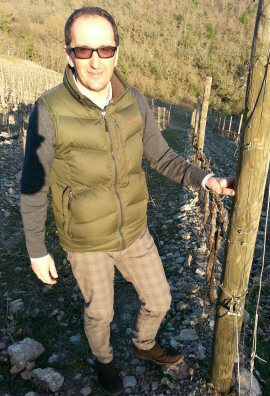 Winemaker Federico Giovannetti explains there were very few vineyards – just a small plot for home consumption, not a professional production – when Zonin bought the farm. The Maremma has a warmer climate than the rest of Tuscany, with easy ripening of vines, and Federico says that whilst Bordeaux varieties thrive here, there is still significant vintage variation. In 2003 a project was started with Denis Dubourdieu to make a new top wine bearing the estate name. Choosing from Merlot, Cabernet Sauvignon, Syrah and Petit Verdot, the percentages of each variety used changes each year because of those vintage variations. The first release was in 2008. “It’s a Bordeaux Hermitage” jokes Denis, explaining that in all five vintages we will taste there is always Syrah and Petit Verdot, but the inclusion of Merlot and Cabernet depends on the year. Asked if that means Petit Verdot and Syrah are better suited to this terroir, he agrees. A little age on rim, just softening. A nicely autumnal feel. Spicy and a touch meaty, with a deep spicy mulberry fruit. Tobacco richness. On the p[palate the fruit is smooth and sweet, with a touch of liquorice, endive bite to the tannins and the fruit extraction. It seems a touch hot too? There is a nice fruit core to this, and a softening touch to the finish, though it retains that serious bittersweet bite. No Merlot in this year as it was “too shrivelled and pruney.” 40% Syrah, 40% Petit Verdot, 20% Cabernet. 90-91/100. Feels a little dank or diffuse compared to the 2009, without the clarity of fruit. There is a big dry extract core to this – too dry – with vinosity and vestigial sweetness, but it is pretty tough at this stage. Late on the palate a little glimpse of sweet fruit, but so dry and rather uncompromising. Cabernet dominates in this vintage, and Denis says it need considerable time. 88/100. A little lighter, ashy and peppery lift to this. Is it a touch briary. But I like the lift and pure perfume. The palate has more silk too – silkier tannins and a purer, softer black fruit of cassis and cherry. Lovely wine, that touch of red fruit brightening and sweetening the big tannins and coffeeish depth of the finish. Long and sweetly structured. All varieties used: 45% Petit Verdot, 21% Cabernet, 17% Syrah, 14% Merlot. 91/100. A sample of the finished and blended wine that will be bottled in one month. Spiced plum fruit is lovely, and has a little cassis and the oak adding a cedar and vanilla smoothness. On the palate very well balanced, with lovely cassis and sweetness coming through. Has lovely lift and sweetness, very pure. Long, youthful but has such nice balance and openness. No Cabernet – too green. 48% Petit Verdot, 35% Syrah, 17% Merlot. 92-93/100. Just blended, but not bottled. Primary aromas of course but has a lovely Syrah lift, a touch of game and meatiness, but lovely buoyant fruit is coming through very nicely. The palate has a lean streak to the tannins and plenty of acidy, but there is a real sense of structure supporting sweet fruit here. The dry extract gives a smoky, ashy dryness, but there is a fruit sweetness at the core and the oak sits nicely adding just a spice. A very promising wine this. No Merlot, 40% Syrah, 40% Petit Verdot, 20% Cabernet. 93-94/100. Find all stockists of Rocca di Montemassi wines on wine-searcher. The wine tasted – Deliella – is one of the top ‘Crus’ of the Feudo Principi di Butera estate in the province of Caltanissetta in Sicily, which Zonin acquired in 1997. It is made from 100% Nero d’Avola, grown at 350 metres altitude on limestone and marl soils. Christophe Olivier from Denis Dubourdieu’s team says Nero d’Avola is a variety that has adapted to the heat of Sicily and needs half the water of many other European varieties to survive. He does not think it is a variety to age – suggesting it is normally best to drink within five years perhaps. Not yet bottled. Maturation for 18 months in 350-litre tonneaux and large, 3,000 litre oak barrels followed by a further twelve months in bottle before release. Delightful cherry freshness and lift here, with a touch of charcoal and inkiness, but really it is about the fresh fruit. The palate has juiciness and life. It is powerful, but there is such a sweet core of fruit and the cleansing acidity, of tart cherry and plum skins powers through this. There is plenty of dry extract, but it has lovely fruit and racy balance and harmony. Charming fruit complexity and really expressive Nero d’Avola, with hints of peach and passionfruit. 90-91/100. Find all stockists of Feudo Principi di Butera wines on wine-searcher. From Friuli, 100% Sauvignon Blanc. A touch of gooseberry and asparagus aromatics, with gently handled elderflower notes, and a core of quite peachy, almost nectarine like fruit. It has real texture and mouth-filling presence, with exotic fruit character and lots of grapefruit and orange. There is a touch of the Sauvignon Blanc grassiness, but this is relatively low in acidity (for SB) with that developed nectarine fruit and orangey acidity. Delicious stuff. 88/100. Ca’ Bolani, Aquilis 2013, Italy Unbottled sample. This still has some ferment aromas of pear-drops that are masking the real fruit character a little, but there is a grassy, soft herb note here that is lovely. The palate seems considerably more sharply focused than the 20011, a keen, racy, almost mineral edge to the fruit and acidity with lemon rather than orange, but then a pithy grapefruit zest finish adds a real sharpness and definition. Potential to have the drinkability of the 2011 but with added élan and focus. 90-92. Find all stockists of Ca’ Bolani wines on wine-searcher. Find all stockists of Zonin wines on wine-searcher.